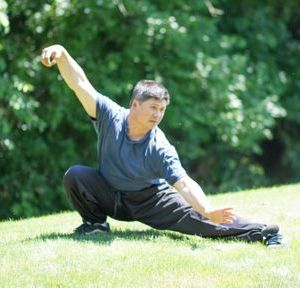 Tai Chi Classes in Ledyard, CT.
* This form of Tai Chi is also referenced as "Gu School Taijiquan"
Tai Chi is China's national form of exercise and is by far one of the most popular martial arts in the world. From an outside appearance it is slow and balanced. It does however concentrate on developing internal power, increased circulation, movement of energies, clarity of mind and overall harmony of the body. Although it is well known for its health benefits alone, it should be noted that it is an excellent martial art as well. To use Tai Chi well, you must have a good understanding of its energies and know yourself. Only then can you apply it. Tai Chi fighting begins through diligent practice of push hands.